Windows is keeping hidden records of everything you do right now! Try this most advanced window system cleaner and hard disk cleaner. Evidence Terminator is the most advanced hard disk cleaner in the world. Its innovative new scripting engine means it customizes itself for your all of your system's users, automatically! 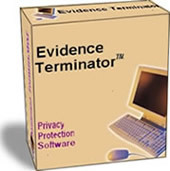 You will rest assured knowing all those secret ghost files have been deleted with Evidence Terminator, Protect yourself from any unnecessary embarrassment, at your home or work with this incredible, innovative new software. Speeds Up Your entire computer! Increases Your System's Overall Stability! A Script Wizard for easy configuration!